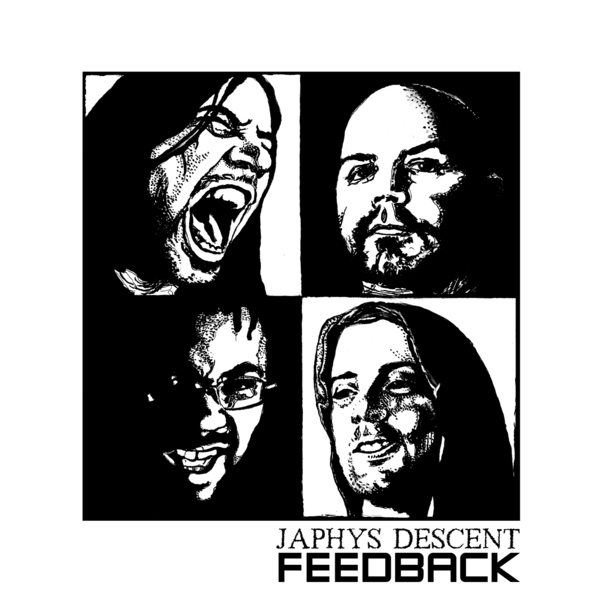 Japhy’s Descent has been a staple of the Tempe live music community for some time now, but it is only been recently, I have to say that the band has really come into their own—they’ve only just now defined their sound, or better yet, refined their sound. This was never more apparent than at the CD release party for their new five song Feedback EP, where they gave what was arguably the best performance of their lives and Travis, in particular, looked as though he was simply possessed. “Answer 42” blows the roof off the house and opens the new record with a scorching bass line that will reverberate your very soul. This is easily the best song Japhy’s has ever written, recorded or otherwise released to the world. It also expands the parameters of their sound to new heights, snarling vocals, a sing-a-long chorus and lyrics that tackle life, the universe and everything. This song is pure excitement distilled into four minutes of straight out rock’n’roll. Not far from the opener, “Ghost” continues the mystical groove they seem to have caught a hold of on this round of recording and in this instance the song really recalls the energy and sound that made bands like Soul Asylum so vital in their day, Japhy’s makes this sound their own without sounding dated in the least. “Red Flags” is a surprising number as it steps away from hard rock and plays around with the sound of a down home jam that touches a bit on the Southern Fried fantasy with guitar picking and grinning for miles, it would make a great second single following the heavy footsteps of “Answer 42.” Though it’s called “Ballad”, it’s pretty far from that concept, perhaps “Rock Song” would have been better, since this rocks harder than any ballad I’ve ever heard. It also packs a hell of a groove into its near epic 7 minute length, heavy, hazy, hypnotic rock through and through, which is to say, absolutely delightful. “Tapped Out” finishes the EP on an almost sentimental note, still filled with plenty of fury and fun, it’s a classic reflective rocker that would be an appropriate set closer…”As we wave goodbye to our friends, as we wave goodbye to our friends…” I could almost hear the end turned into a huge gospel chorus finale that would blow minds. If Japhy’s Descent first record was Just A Peak, this is the whole goddamned mountain range, it seems everything they do is a blues drenched, psychedelic, rock odyssey. There is no telling what’s in store for Japhy’s fans when this spring sees the release of the double album Moon Noon, somehow I have the feeling they will pull out all the stops and their frenetic, frantic antics will come to the fore and shine through every groove. Feedback is available at Amazon, iTunes and CDBaby.com.